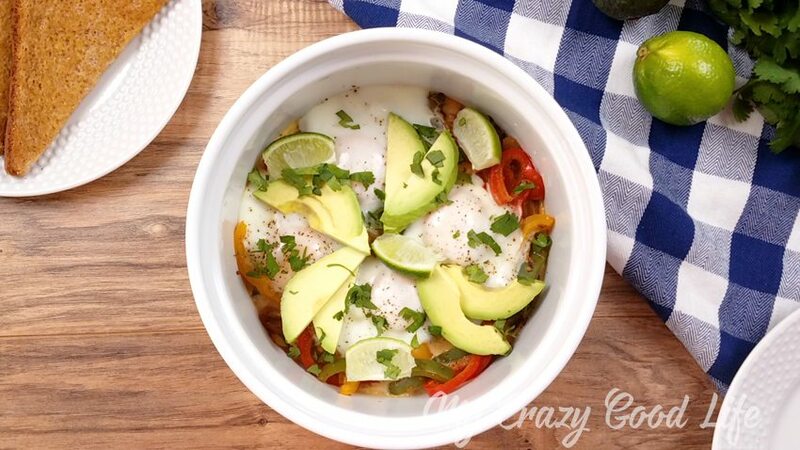 Every once in a while an idea comes along and I think to myself, “why didn’t you think of that sooner?” This is the situation with this Instant Pot Fajita Breakfast Casserole. It’s a 21 Day Fix Breakfast Casserole Recipe that is a perfect pre or post workout meal for 8o Day Obsession. How many people does this healthy breakfast casserole serve? Is this a vegetarian breakfast casserole? It is! You can enjoy this vegetarian breakfast casserole in very little time. Even if you are making this in the oven or on the stove top it’s a quick and easy process! I love it because I can start my day off on the right foot without much stress in the kitchen. Is this breakfast casserole healthy? Yes! It’s got so much good stuff in there to power your day! 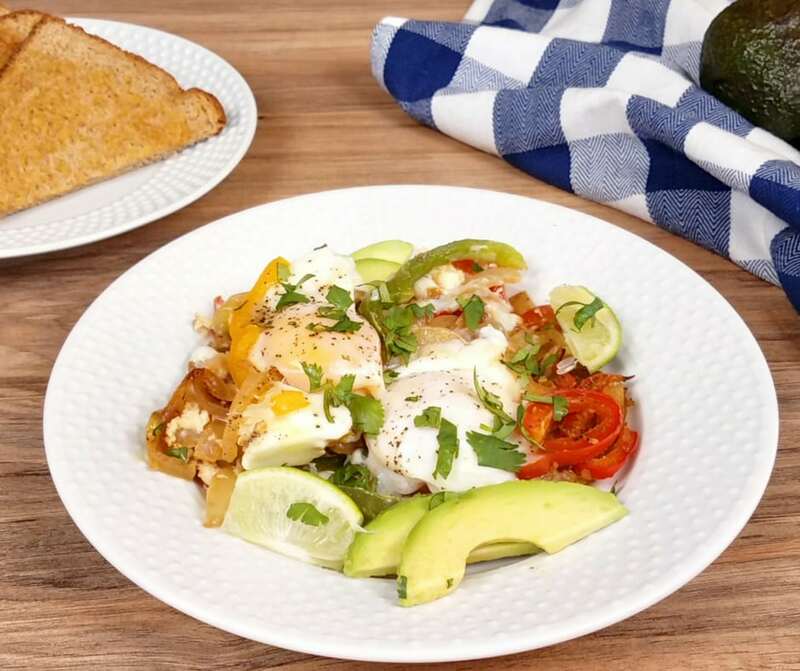 The eggs and veggies will give you a nice protein boost for your morning. It’s also low in calories, at less than 300 per serving you will be starting the day off on the right foot! You can make this ahead of time if you have a busy morning planned! I don’t usually do that because it doesn’t take all that long to put together but if I know I’m going to be in a rush I know I can save some time by sautéing my veggies the night before! If you are really pressed for time you can make this whole thing the night before and just warm it back up in the morning before cutting and serving! 1) Turn the Instant Pot to sauté, add the olive and allow it to heat up. Toss in the garlic, onions, and bell peppers to sauté them. Sauté for about 5 minutes until the edges of the onions and bell peppers start to brown like fajitas. 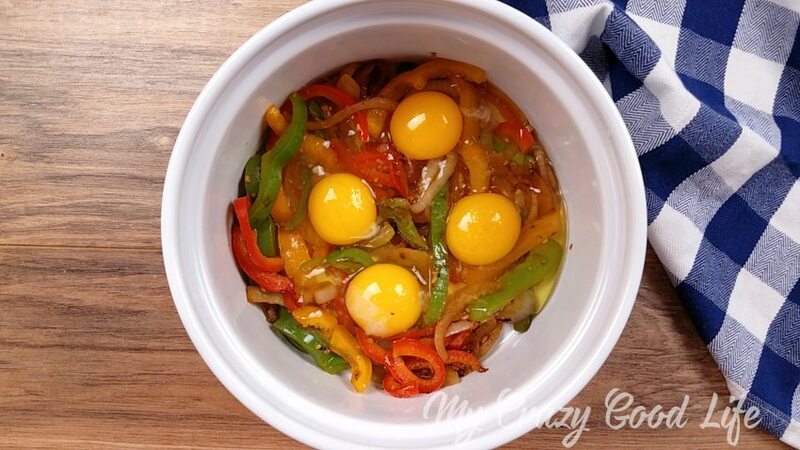 2) Turn off the Instant Pot and transfer the bell peppers and onions to a round oven safe pan that will fit inside. I used a 2-quart souffleé pan, but any oven safe dish would work. 3) Gently crack four eggs and place them on top of the peppers so that the yolk is intact. Sprinkle with salt and pepper then cover with foil. 4) Place the trivet at the bottom of the Instant Pot insert and add 1 cup of water. Cover your dish with foil, and then use a large piece of foil folded into thirds to make a sling to lower and remove the dish from the Instant Pot. Gently lower the dish to sit on top of the trivet. Lock the lid into place and close the pressure valve to sealing. Cook on high pressure for 2 minutes using the manual function. Release pressure using the quick release function. 5) Remove the pan from the Instant Pot (using that foil sling that you have around it). Top with avocados, cilantro, and sliced limes. Perfect with a side of whole wheat toast. Can I make this breakfast casserole on the stovetop? 1) Preheat a skillet on high heat and add the olive oil. Once the oil is hot sauté the garlic, onions, and bell peppers for 1-2 minutes. 2) Gently crack the eggs over the vegetables and sprinkle with salt and pepper. Reduce the temperature to medium heat. Cover the pan and allow to cook for about 1-2 minutes until the egg whites are no longer translucent. Remove the pan from the heat and serve immediately topped with avocado, limes, and cilantro. I’d prefer to bake my breakfast casserole, can I do that? 1) Preheat your oven to 400 degrees F. Toss the onions and bell peppers in the olive oil and garlic then layer them on a baking sheet. 2) Gently crack the eggs over the vegetables. Sprinkle with salt and pepper then bake in the oven for 12-15 minutes depending on how soft you like your eggs. 3) Remove from the oven and serve immediately. Top with sliced avocados, limes, and cilantro. 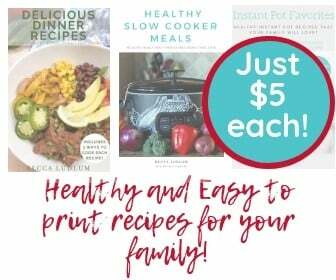 If you’re looking for more no yellow breakfast recipes or 21 Day Fix Instant Pot recipes, I have them! What should I serve with this breakfast casserole? How about serving up this breakfast casserole with some sweet potato hash? I’d also recommend this healthy breakfast fried rice! 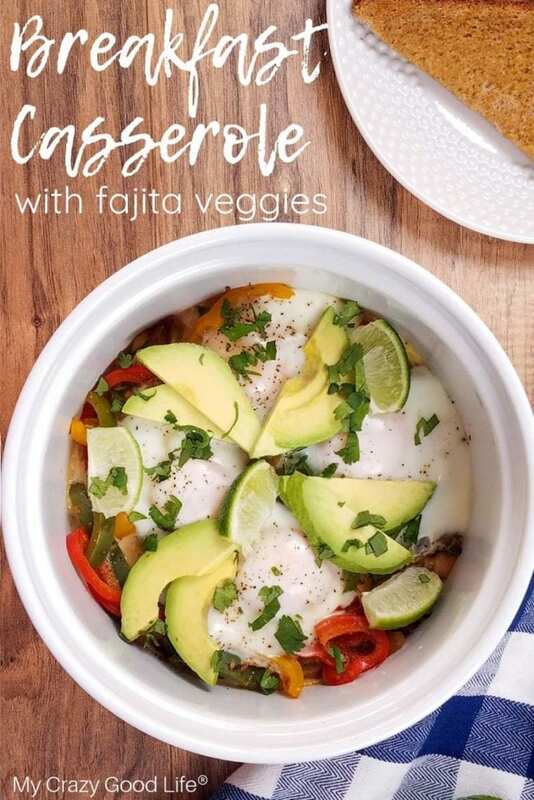 This Instant Pot Fajita Breakfast Casserole is the perfect quick breakfast for your busy morning! A 21 Day Fix Breakfast Casserole can help you start the day off right with a no yellow breakfast! This is a great 80 Day Obsession pre-workout recipe, too–just add some wheat toast! Turn the Instant Pot to sauté, add the olive and allow it to heat up. Toss in the garlic, onions, and bell peppers to sauté them. Sauté for about 5 minutes until the edges of the onions and bell peppers start to brown like fajitas. 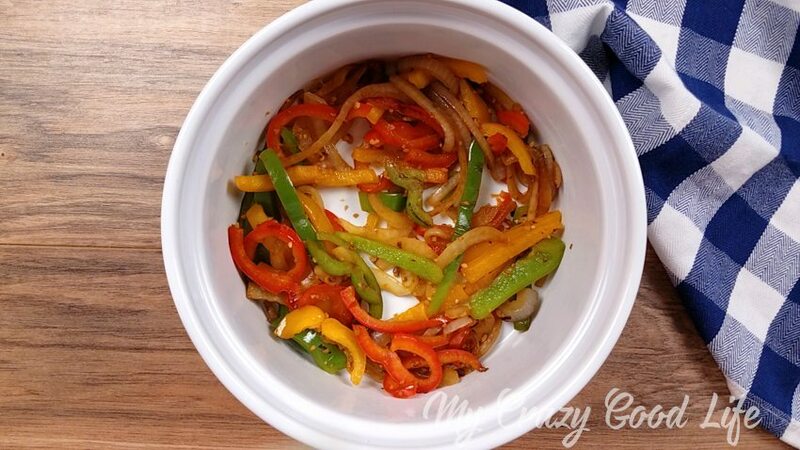 Turn off the Instant Pot and transfer the bell peppers and onions to a round oven safe pan that will fit inside. I used a 2-quart soufflé pan, but any oven safe dish would work. Gently crack four eggs and place them on top of the peppers so that the yolk is intact. Sprinkle with salt and pepper then cover with foil. Use a large piece of foil folded into thirds to make a sling to lower and remove the dish from the Instant Pot. Place the trivet at the bottom of the Instant Pot insert and add 1 cup of water. Gentle lower the dish to sit on top of the trivet. Lock the lid into place and close the pressure valve to sealing. Cook on high pressure for 2 minutes using the manual function. Release pressure using the quick release function. Remove the pan from the Instant Pot. Top with avocados, cilantro, and sliced limes. Perfect with a side of whole wheat toast. Preheat a skillet on high heat and add the olive oil. Once the oil is hot sauté the garlic, onions, and bell peppers for 1-2 minutes. Gently crack the eggs over the vegetables and sprinkle with salt and pepper. Reduce the temperature to medium heat. Cover the pan and allow to cook for about 1-2 minutes until the egg whites are no longer translucent. Remove the pan from the heat and serve immediately topped with avocado, limes, and cilantro. Toss the onions and bell peppers in the olive oil and garlic then layer them on a baking sheet. Gently crack the eggs over the vegetables. Sprinkle with salt and pepper then bake in the oven for 12-15 minutes depending on how soft you like your eggs. Remove from the oven and serve immediately. Top with sliced avocados, limes, and cilantro. Weight Watchers Freestyle Points: 2 freestyle points per serving, for the olive oil. Previous Post: « Q&A: What Is 80 Day Obsession? Becca – I just made the fajita breakfast casserole and I. Am. In. LOVE. What an awesome recipe and so easy! I used chipotle olive oil and added grape tomatoes…so delicious! Thanks for the recipes! I can’t wait to try the sous vide eggs this weekend. Yay!! Thank you for sharing!! 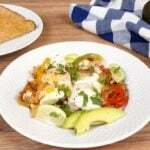 Be careful if you attempt to add more eggs or pre-cooked fajita meat. I added a handful of beef and one of chicken. I added 8 eggs to serve four people. I pressure cooked the dish for 4 minutes and eggs were still raw. 4 more minutes, raw. Again 4 minutes, raw. Finally another 5 minutes and the eggs finally cooked. Just wanted to share for those looking to reuse fajita leftovers. Thanks for the feedback! Yes, the Instant Pot makes little changes like this (adding meat) a little tricky.